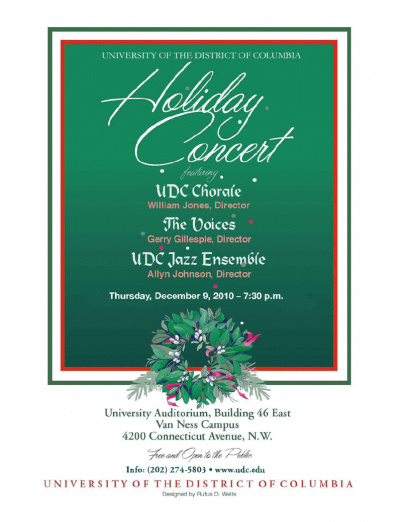 “You are cordially invited to the University of the District of Columbia’s Holiday Concert on Thursday, December 9, 2010 at 7:30 p.m. in the University Auditorium. The concert is the University’s annual holiday gift to the Washington, D.C. community and is free and open to the public. The UDC Chorale directed by William Jones starts the evening with a program of choral music followed by the gospel sounds of The Voices, directed by Gerry Gillespie. The UDC Jazz Ensemble directed by Allyn Johnson closes the program with big band jazz sure to spread the holiday spirit. We hope that you and your friends will join us to celebrate this season of joy and thanksgiving.